In the State of Florida, a person injured as the result of another person’s negligence is able to recover damages for emotional injuries as well as physical injuries. The emotional damages recognized under Florida law include things like loss of consortium, loss of enjoyment of life (depression), anxiety, and many other non-physical types of damages. Emotional damages aren’t as easy to see as a physical injury, like a broken leg or a spinal cord injury. Which means that emotional damage claims are vulnerable to being fraudulently made. Sadly, in Florida especially, there are a lot of bad actors who are always looking for a way to make a fast buck, and filing a fraudulent insurance claim for emotional harm has been a common tactic of these wrongdoers. So, in order to prevent these fake claims, Florida lawmakers established the “impact rule” as a method of sorting out the phony claims from the real ones. Under the “impact rule,” the law provides that there must be a physical harm or “impact” before there can be an award of emotional distress damages. However, this rule doesn’t always apply. 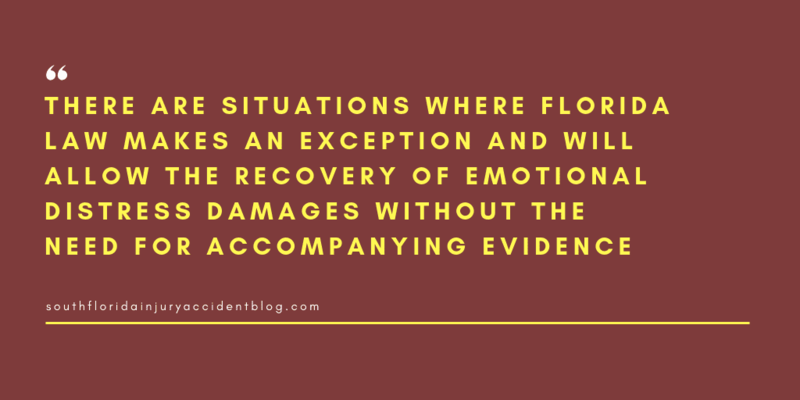 There are situations where Florida law makes an exception to this general rule, and will allow the recovery of emotional distress damages without the need for accompanying evidence of physical injury or harm. First off, in Florida it is not easy to establish an exception to the impact rule. Cases where emotional distress damages can be awarded without evidence of physical impact are considered to be in a “narrow class of cases.” See – Rowell v. Holt, 850 So.2d 474, 478 (Fla.2003). For these damages to be awarded outside of the impact rule, extraordinary circumstances must exist (and be proven and admitted into evidence). Those who suffer emotional distress after a wrongful birth or stillbirth. Victims of willful and wanton negligence. Patients whose confidentiality has been breached by their psychotherapist (e.g., psychologist, psychiatrist, etc.). Claims based upon invasion of privacy. Claims based upon the intentional infliction of emotional distress. In the case of Gracey v. Eaker, 837 So. 2d 348 (Fla. 2002), the Florida Supreme Court ruled that Donna and Joseph Gracey could recover emotional distress damages from Florida psychotherapist Dr. Donald W. Eaker without any evidence of physical impact. Meaning, the impact rule did not bar their recovery of damages. Here’s what happened. The Graceys were patients of Dr. Eaker, a licensed psychotherapist, seeing him for marital problems. They saw him in individual therapy sessions. In these counseling sessions, the Graceys alleged that Dr. Eaker would ask them things that were “very sensitive” and “very personal.” Things that they had not shared with each other. Donna and Joseph shared their most private secrets with their doctor, even though they hadn’t shared them with each other, because Dr. Eaker had told them it was vital to their therapy and the goal of improving their marriage. So, they sued him for breach of his fiduciary duty to them (set up in the Florida statutes as well as common law) and they asked for emotional damages based upon the “severe mental anguish” they each suffered after their spouse’s secrets were shared with them, and the destruction of their ability not only to trust each other, but to be able to trust others in other personal relationships because of Dr. Eaker’s actions. However, the court found that the use of the rule wouldn’t allow for justice to prevail. Since the Florida Legislature had “recognized and found that one’s emotional stability and survival must be protected to the same extent as physical safety and personal security,” the Florida Supreme Court ruled that the impact rule does not apply in cases where a psychotherapist breaches his or her fiduciary duty of confidentiality to a patient. Have You Suffered Emotional Distress After an Accident or Injury Here in Florida? Whenever you are hurt or injured due to the actions of another, whether the act is intentional or whether it’s an accident, there are consequences for both you and your loved ones. Some of those consequences can include emotional damages. Unfortunately, these claims are not easy to prove; in most instances, you must meet the “impact rule” — but there are situations where that burden of proof does not exist. Claims based upon defamation, invasion of privacy, and more, can form the basis of an injury claim without the need to show some type of impact. Of course, the insurance company will fight an emotional damage claim as being exaggerated or even fake. An experienced Florida injury lawyer can be invaluable in these situations. A good piece of advice if you intend to purse an emotional distress claim is to talk with an experienced personal injury lawyer to discuss how most insurance companies will treat your claim and learn about some of the issues that can arise with these claims, including the type of evidence needed to prove a claim and the type and amount of damages you can recover. Most personal injury lawyers, like Alan Sackrin, will offer a free initial consultation (over the phone or in person) to answer your questions. Do you have questions or comments? Then please feel free to Chat with Alan in the comments below, send him an email, or call Alan now at (954) 458-8655. I have been suffering extreme emotional distress since August 4th due to a series of incidents within my community. I want to sue …. I need to filed a suit to Holland America Cruise.